The film follows a woman who killed her husband (Lee Major’s first film role) and his mistress with an ax after she caught them having an affair. She was sent to a psych hospital for 20 years then released to her brother’s family farm where her now 23-year-old daughter is studying to become an artist and has a fiance. Soon though, people start turning up dead with their heads cut off. William Castle weaves his story to make you believe that Crawford is still the killer, but there might be someone else wielding the ax this time who is very close to her. It’s still a fun film with some good decapitations and gimmicks used throughout, however, it’s a slower pace with some cheap filler. Still, it’s a fun horror film that has Joan Crawford at her finest. Scream Factory has delivered a great new video and audio presentation along with some brand new bonus features, which are listed below. 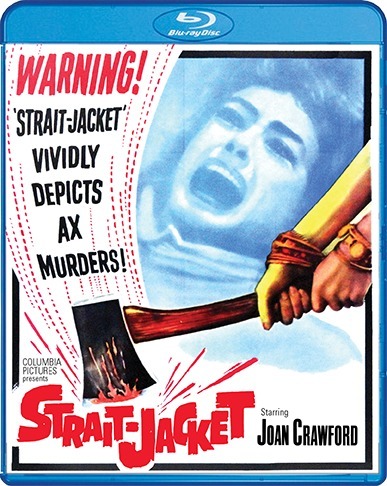 In Strait-Jacket, film legend Joan Crawford gives a terrific performance in this chiller from pioneer horror movie producer William Castle. Crawford plays Lucy Harbin, a woman who goes berserk when she finds her husband in bed with another woman. With her three-year-old daughter accidentally witnessing the grisly act, Lucy axes the couple to death. She spends twenty years in a mental institution for the double murder. After she is released, she moves in with her brother, Bill (Leif Erickson), his wife, Emily (Rochelle Hudson) and Carol (Diane Baker), her own daughter who is now twenty-three. Her nightmare is over … or is it? When a spate of ax murders start occurring suddenly in the neighborhood, police think Lucy has reverted to her old ways. The truth is finally revealed in a rousing, blood-chilling finale. This entry was posted on Thursday, October 11th, 2018 at 1:31 pm	and is filed under Film, News, Podcast. You can follow any responses to this entry through the RSS 2.0 feed. You can skip to the end and leave a response. Pinging is currently not allowed. « ‘First Man’ Film Review!